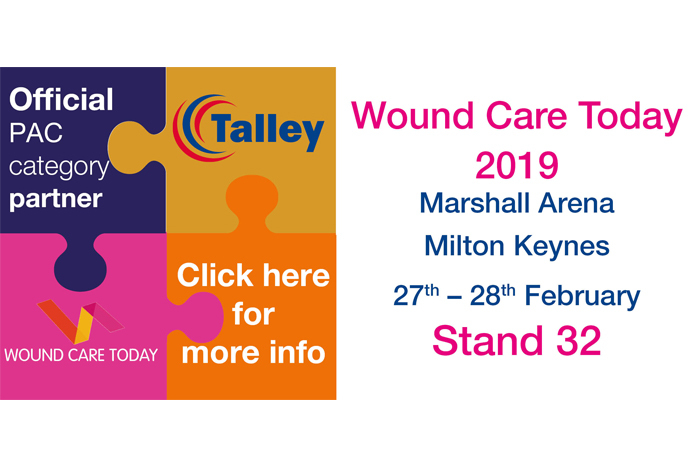 Empowering clinicians at Wound Care Today 2019…..
Talley are delighted to announce that we will be continuing our exclusive pressure ulcer category partnership with Wound Care Today throughout 2019, so come and see us at the free to attend WCT 2019 annual conference on the 27th and 28th February in Milton Keynes. Click here for our event flyer. Our focus this year is on pressure area care (PAC) support surface SAFETY and PERFORMANCE and we will be using this year’s conference to educate, inform and explain, how medical device classification and CE marking relates to product safety and performance and how to differentiate between different support surfaces using interface pressure. Having this knowledge will empower clinicians to make fully informed decisions when purchasing, prescribing and using these specialist medical devices for the prevention and management of pressure ulcers. To enable us to deliver this information to delegates at WCT 2019 we are turning our exhibition stand into a dedicated, interactive, pressure area care educational zone where you can ……. PLEASE NOTE: Space is limited so please e-mail wct2019@talleygroup.com to register your interest and reserve your place for the above presentation(s) on stand 32. Ask Sue, our resident TVN! To help you master your craft and reach your potential come and visit our friendly and approachable exhibition team at WCT 2019. We will be happy to discuss how the right PAC support surfaces can help you safely drive down pressure ulcer incidence in line with your local pressure ulcer prevention policy and Sign up to Safety plan. For those of you attending WCT 2019 why not e-mail us at wct2019@talleygroup.com and schedule an informal chat with one of our PAC experts who will set some time aside for you during next month’s conference. In addition to learning all about our independently audited, safe, effective, class leading PAC products and comprehensive service offerings, don’t forget to visit us on stand 32 to collect your free personal safety gift. We look forward to seeing you in Milton Keynes next month. Quality education for pressure ulcer assessment, prevention and management is essential to ensure that patients receive safe, effective, harm-free pressure area care. Wound Care Today is our perfect partner when it comes to delivering the highest quality, free PAC education to clinicians. All of the educational content is independently written and their unique, free-to-use online educational resource can be accessed by all UK and overseas healthcare professionals with an interest in pressure ulcer prevention and management so it has global appeal.